All kayaks are not created equal. There are many different types of kayaks that are engineered and manufactured for very different purposes. Kayaks are made for everything, from running big whitewater in a place like the Grand Canyon to enjoying a relaxing paddle on your local lake. 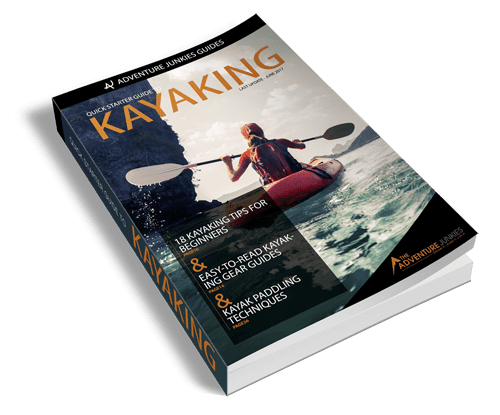 If you’re just starting out, it’s important for you to identify the best kayaks for beginners so that you don’t buy a boat you don’t know how to handle. Your ability to buy the right kayak as a beginner can make or break your early kayaking experience. Finding a kayak that’s easy to transport, easy to handle on the water, and simple to maintain is key. In this article, we’ll cover ten beginner kayaks that’ll get you on the water with minimal effort. 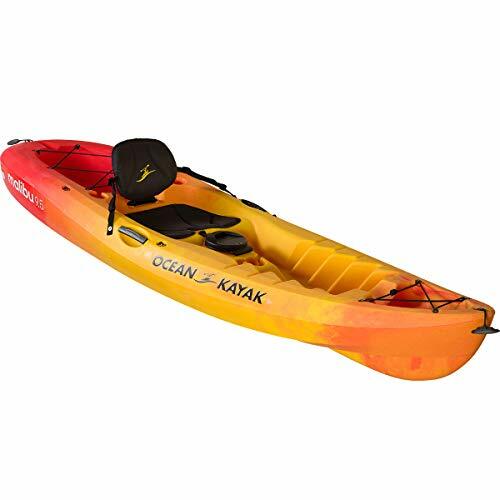 This kayak offers plenty of room to get both parents and a child out on flatwater. It’s best for small lakes and ponds, but is also perfect for paddles on slow-moving rivers. 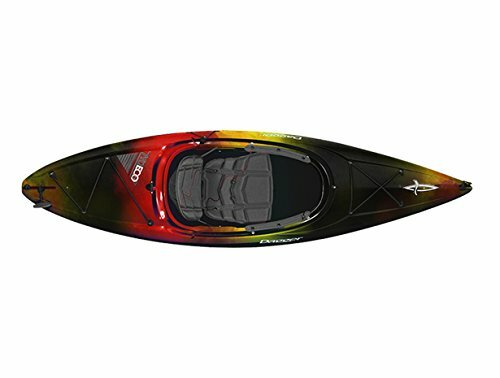 This kayak will stand up to the rigors of getting to and from your local waterway and offers the stability you’re looking for as a beginner. 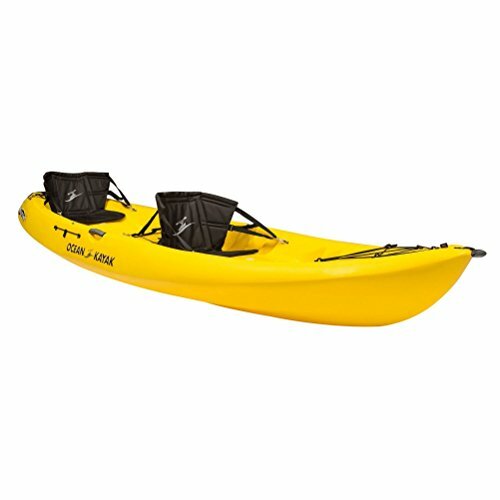 This kayak is also a great option for larger paddlers, as the removable seats can be set up to accommodate a single paddler in the central seat that can otherwise be used for small children. If you and your partner have an adventure dog that goes everywhere with you, the Malibu XL Two also has room for your pup to come along for your next paddle! The Perception Tribe 11.5 is an easy boat to set up and get on the water in minutes. Its built-in seat can be set in place in seconds so that you don’t waste precious time that you could be enjoying on the water. It’s a versatile kayak that’s built mostly for lakes, ponds, and slow-moving rivers. 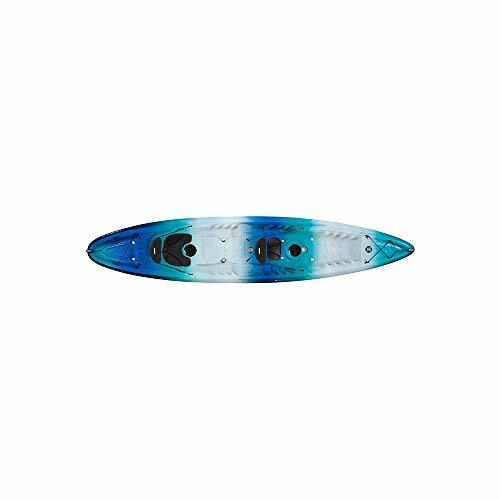 But the Perception is maneuverable and durable enough to handle paddling on calm coastal waterways with light wave action as well. This is a great beginner kayak to hone your skills and boost your confidence before tackling faster-moving water. This small, sit-inside kayak is a perfect choice for beginners interested in taking their flatwater kayaking skills and learning to adjust them to the moving water of rivers and inlets. 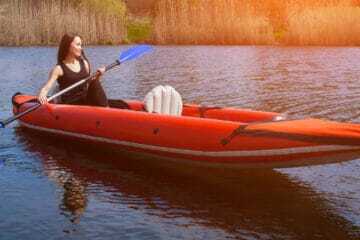 It is a small enough kayak to maintain maximum maneuverability and its sit-in style means less water splashing over the sides in moving water. The Zydeco’s design also makes it easy to load on top of your car to explore new waterways in your area. 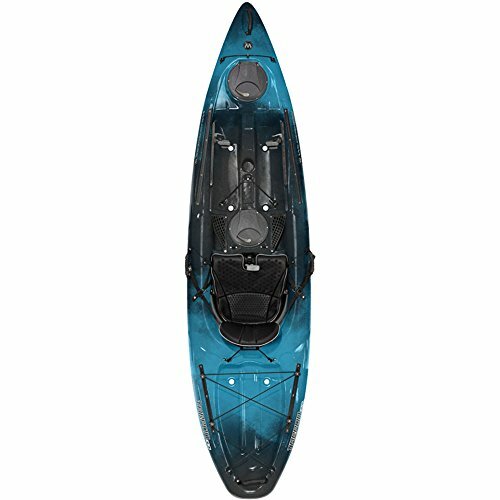 With a roomy cockpit design and adjustable seating system, this beginner kayak combines comfort with fast acceleration and nimble performance, which makes it an excellent option for both flatwater cruising and navigating faster moving waters. If you’re looking for a kayak that you can take on a day-long or multi-day paddling expedition, the Revel 10 is an excellent choice. The kayak’s arched bottom serves to maximize efficiency when you’re paddling for hours at a time. It also features chine rails that provide added stability as water conditions change throughout the day. In terms of comfort, this kayak comes with a padded seat back, seat pad, and thigh braces that keep your body cradled all day long. Adjustable, heavy-duty foot braces also help to keep your body in an ergonomic paddling posture, which helps you paddle more effectively on longer outings. The Old Town Dirigo has a compact and lightweight design that makes it easy for small paddlers to transport and maneuver on the water. Old Town’s Stabil-form hull design helps to ensure that this kayak tracks well so that you’re not working overtime to keep it straight, despite its shorter hull length. 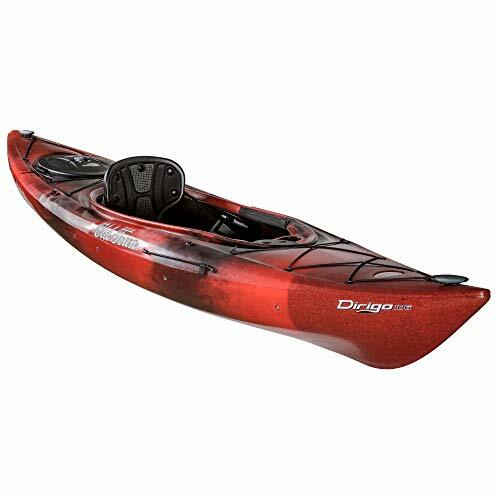 With a durable, three-layer polyethylene construction, this kayak is designed to outlast the competition. It will handle loading on and off your vehicle of choice, as well as being dragged or carried from your car to the water’s edge. Finally, a thoughtful safety line that wraps around the perimeter of the boat ensures that the paddler has a place to grab hold of the kayak and a handhold for re-entry in case they accidentally fall out of the boat. The Tarpon is an excellent choice for environmentally-friendly anglers looking for a vessel to get to those hard-to-reach fishing locations without the use of a motor. Its hull design makes it easy to handle in tight spaces, but also allows you to get moving at a solid clip over longer distances. Capable of handling light surf in addition to the calm waters of lakes, bays, and ponds, this kayak features tons of storage space via bow, midship, and stern compartments. It also gives you the ability to attach multiple items to the rails on the gunwales, which comes in handy when it comes to securing and organizing all of your fishing gear. It takes two to tandem! This tandem kayaks fits two paddlers comfortably. Each paddler gets his or her own large, accessible cockpit area with adjustable foot braces and seat back that help you maintain proper paddling posture. The Argo features comfortable handles at the bow and stern to make carrying this kayak to the water’s edge easy. And it also gives both kayakers a cockpit table with handy compartments and a bottle holder so that you can enjoy lunch or a snack while floating. This 9.5-foot kayak offers the performance you’ll need for fun and comfortable day outings. But it won’t take up a bunch of unnecessary space in your garage or under your house when not in use. It’s also compact and lightweight enough to load easily on and off your car when you decide to take it out for a spin. 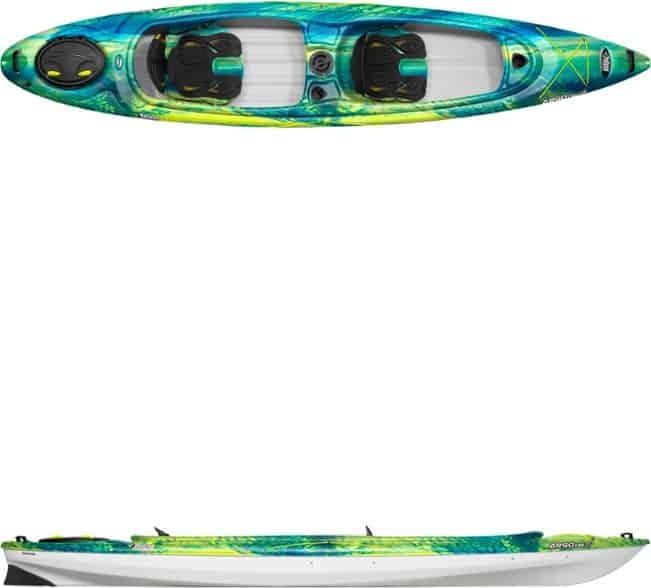 Those looking to buy multiple kayaks will also appreciate the stackability of the Malibu 9.5. These kayaks are molded to fit together and stack up to four-high safely. Their molded-in seats make them easy to unstack and setup in seconds, which can be especially handy for those that want to keep multiple kayaks ready for groups to get out on the water quickly and efficiently. The Perception Tribe 13.5 is the perfect kayak to get two adults on the water with all the gear you need to spend a full day out. Its central removable “jump” seat can also be used for a small child or to bring your trusted travel pet along on your paddle journey. Bungee deck rigging at the bow and stern of this boat give you two places to secure dry bags or other gear. For couples just getting into kayaking, the Tribe 13.5 offers an incredibly stable hull design and it also contains built-in scupper holes that allow water to drain instead of pooling in the footwells and making the boat harder to paddle. While it’s best for day adventures on flatwater in lakes, bays, and ponds, this kayak is also stable enough to handle light wave action in coastal waterways. Inflatable kayaks are best for travelers that might not have the space to store a hard plastic kayak all the time. 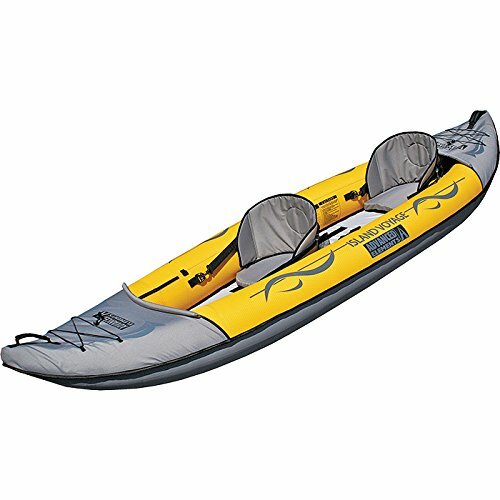 This kayak can deflate and roll up to packed dimensions (in inches) of just 31 x 18 x 10 until you need it. It also features a durable enough design to make paddling on flatwater easy and comfortable. The Island Voyage 2 is made with heavy-duty PVC Tarpaulin hull material and features strong polyester tube covers to protect it from scrapes and punctures. Its durable, Honeycomb deck material helps to keep the hull of the kayak rigid enough to keep paddling efficient and effective. This kayak’s removable seats can also be set up in three distinct positions, which make it customizable for either solo or tandem paddling. The area where you’ll mostly be paddling will dictate the type of kayak you need. 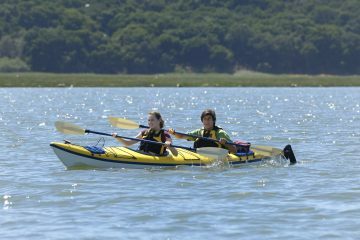 Coastal waterways or ocean kayaking requires more stability and splash protection than paddling on flatwater. Fast-moving water necessitates a kayak that can maneuver very quickly to help you avoid objects. Just to be clear, running large rivers isn’t the place to start as a beginning kayaker. 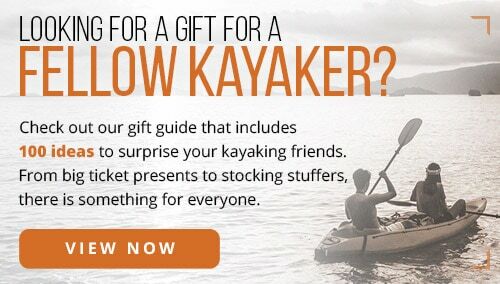 But consider the waters you’ll primarily be paddling on before you settle on a kayak type. 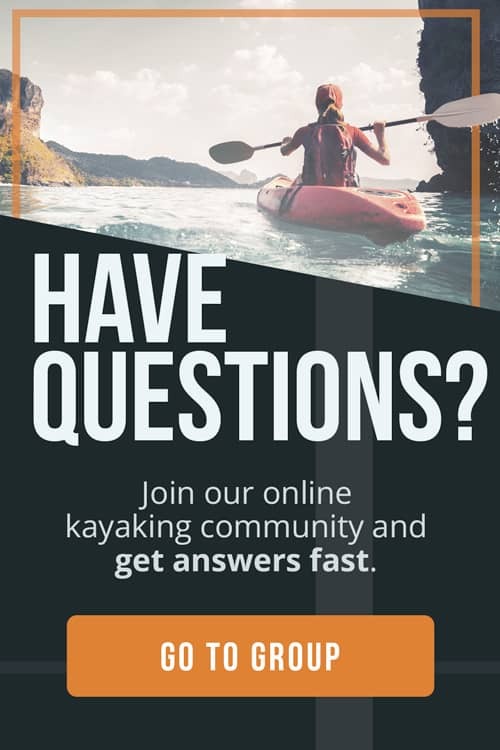 While there are more than just two styles of kayaks, those that you should be most concerned about deciding between are sit on top and sit inside kayaks. Sit inside kayaks offer more protection from splashes, but they don’t drain at all if water does happen to get inside. Sit on top kayaks tend to get the paddler wet from the outset, but they naturally bail water from footwells by way of built-in scupper holes. While it might seem counterintuitive, sit on top kayaks are generally better for complete novices because they’re easier to right and climb back into if you do happen to flip. Here are some additional tips on how to choose a kayak that’s right for you. Weight is mostly going to come into play when you’re transporting the kayak to and from wherever you like to paddle. Keep in mind that most of the damage that kayaks sustain actually happens when they aren’t in the water, so it’s important to choose a kayak that you can handle safely when it’s not in the water. While this is important to the longevity of your kayak, it’s also important to your long-term health. 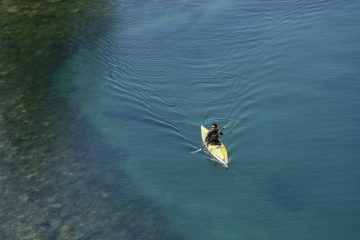 A lighter kayak makes transportation easier and, as a result, often makes kayakers more likely to get on the water. Here are some additional tips on how to transport a kayak. While inflatable kayaks are the most compact and easy-to-transport option out there, they generally don’t offer the longevity and durability of kayaks made with polyethylene. This hard plastic is the predominant substance used to manufacture most of the best kayaks for beginners. Some kayaks are made from separate top- and bottom sections, whereas others are created as single structures. 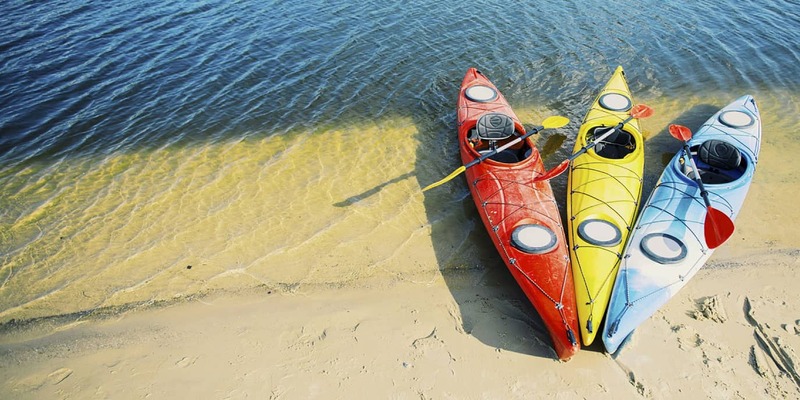 In general, kayaks that feature a single, fully-molded design, as opposed to separate top and bottom sections that are welded together, are going to be more durable and last longer. The hull of a kayak is its bottom. This is the part of the kayak that sits underwater once you sit inside (or on top) of it. The design of a kayak’s hull plays a large role in how it tracks (stays straight) and how easy (or hard) it is to maneuver. We BOW FORWARD and a STERN face is the one our mom gives us when we might want to go BACK and do something differently. This is how we remember the areas of our kayak that these terms refer to. The bow of your kayak is the front and the stern is the back. Not all kayaks have a skeg or tracking fin. But those that do are typically longer models that can have a more difficult time tracking straight in the water. Skegs or tracking fins attach to the hull (bottom) of a kayak to help it stay straight, at least until the paddlers get in rhythm and are able to correct the kayak’s course on their own. Kayak storage hatches give you a place to store extra gear for day-long or multi-day paddling trips. While they can seem like the perfect place to store dry goods, almost all experienced paddlers have a horror story about being let down by storage hatches that they really needed to keep their gear dry. While storage hatches give you a great place to take more gear with you, we always recommend purchasing dry bags or boxes to store sensitive gear in before placing it in your kayak storage hatches. No, your kayak isn’t broken! Those small, round holes are built-in for a very good reason. Scupper holes are located in the footwells of most sit on top kayaks. They serve to bail water from footwells instead of allowing it to pool in that area. Unlike with a sit inside kayak, with which you’ll need a hand-pump bailing system, scupper holes allow any water that comes over the gunwales (sides) of your kayak to drain out effortlessly. Gunwales are the sides of your kayak. When you’re sitting inside, they are the ‘rails’ located immediately to your left and right. Some kayaks have gunwales with molded handles, some feature gunwales with rubber handle straps, and others offer gunwale attachment systems that make it easy to secure fishing gear or additional items that don’t fit in the storage hatches. A kayak’s chine rails are the points at which the boat’s bottom meets its sides. They define the shape of a kayak’s hull as either being rounded or boxy. Kayaks typically come with either ‘hard chines’ or ‘soft chines’. Hard chines provide better edge control for improved maneuverability, but they also make a kayak more vulnerable to flipping if its harder edges get caught. Soft chines make for a more forgiving ride. While a kayak with soft chines might not be as quickly responsive, its action will be more predictable if the bottom strikes a shallow area. Tucker grew up in the mountains of Northern California. An avid traveler, he has since lived in San Diego, Fort Collins, Colorado, Maui, Austin, Texas, and Costa Rica. But he always circles back to his hometown of Truckee and will soon be based out of Santa Cruz, CA. He works as an outdoor guide during the summers, leading kayaking trips on Lake Tahoe and hiking/mountain biking excursions in the surrounding mountains. His favorite John Muir quote is, "When we try to pick out anything by itself, we find it hitched to everything else in the Universe."